D's Custom Creations - Custom Health Pharmacy, Inc.
D’s Custom Creations are all made right in our store, at Custom Health in Manitowoc. Every item is handmade with care, and makes an elegant addition to your daily routine, a luxurious touch for a special occasion, or a thoughtful gift. Handmade soap in dozens of varieties. 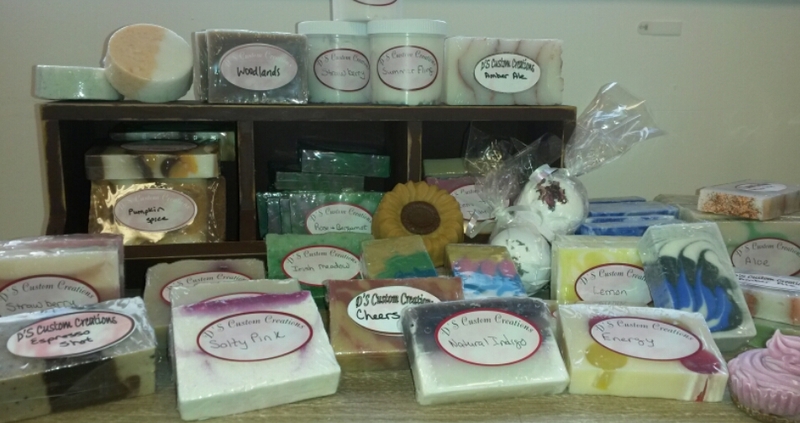 Soaps are sold by the ounce, and are scented in almost any combination you can think of. We also have completely unscented soap, which is free of any scents or dyes, as well as natural indigo, which is a natural antiseptic. The soap is made by hand in small batches, in the store in Manitowoc. You can stop by any time and see bars resting in the nursery, or you may even see Donna cooking up a new batch. Soap stays in the nursery for 4-6 weeks after it’s made, which gives it time to harden and set before its used. The stock is constantly rotating, and there are new colors, scents and designs for every new season and holiday! The newest addition to our Custom line, this Healthy Skin Butter ​is already becoming one of our most popular! Made with almond oil, shea butter, cocoa butter, and green tea extract, Healthy Skin Butter is a perfect addition to any daily skin care routine. Bath Bombs are designed by hand to give you the perfect spa experience right in the comfort of your home. They spin, whirl, and​ swirl in your bath while lightly fizzing to release soothing scents and luxurious skin-softening oils. Each bath bomb is enough to enhance almost any size bathtub, and can transform any day into a soothing opportunity to relax and unwind. For an even more luscious experience, Bath Truffles are a great way to add skin-loving oils to your bath water and body. They include more butters and oils than a traditional bath bomb, while still providing a delightful fizz. Ours are made with a blend of cocoa butter and shea oil, among other skin loving ingredients. Lotion Bars are made with some of our favorite moisturizing ingredients, including cocoa butter, avocado butter. Great for extremely dry or flaky skin, or anywhere skin needs a little extra TLC, like elbows, knees, and feet. The oils add moisture to the skin, while also creating a buffer against harsh environments and​ helping the skin retain moisture.